Paul’s Auntie B.¬†by Koog Family. Next time you come to Milwaukee, be sure to let us know. We’ll take you to Ferch’s Malt Shoppe and Grille – a 50’s style malt and burger shop run by some of Paul’s relatives.¬† It’s THE place to go¬†for some fine Wisconsin Frozen Custard! (That’s what people eat here, basically instead of¬†ice cream). In an age that now seems as distant as a world inhabited by Hobbits, dwarves and dragons, there was a place where time briefly stood still; where a child, confronted by a limitless array of delights, might pause to contemplate the wonders of a universe of his or her own choosing. When the soda fountain disappeared from the corner drugstore to make way for more racks of beauty aids and over-the-counter medicines, something dear to a child’s heart went with it. Almost. Betty Ferchoff, Greendale girl from birth, whose grandparents helped pioneer the FDR-created village in 1938, held on to her memories of a magical place called Des Jardin’s Drug Store, where her aunt-to-be worked the soda fountain until her uncle, a doctor, wooed her into marriage. “I wanted a place that brought back those warm, fuzzy memories,” Ferchoff says of her decision to open Ferch’s Malt Shoppe & Grille, at 5636 Broad St. in the historic Greendale Village. That was in 1988, and Ferchoff went into business with high hopes. By 1992, she had given up, as had many a small-business owner in Greendale. “The landlord lived in Illinois,” she says. “We all had absentee landlords. They took no interest in the place; it was just a tax write-off. Reiman completely remodeled the village and personally asked Ferchoff to return to her downtown malt shop. “So I had to come back and do it all over again,” she says. In 1995, she reopened Ferch’s and began resurrecting her vision – an up-to-date, innovative restaurant that pays gentle homage to the past without trying to replay it note for note. Take frozen custard, for instance. At most places, you’re offered vanilla, chocolate or one or two featured flavors. Ferch’s, thanks to a device call the “Marble Top,” doesn’t bother with a flavor of the week; rather, on any day of the year, you can have any one of just about any flavor you can dream up. Here’s how it works: Ferchoff drops an ample scoop of vanilla frozen custard onto a slab of frozen marble and makes a few shallow slices in it with a spatula. Then she drizzles in a few drops of any combination of the 48 flavor extracts she stocks. With a few deft paddling strokes, she mixes your instant flavor-of-the-moment. Want candies, nuts, fruit or chips? There are 36 of those to choose from, just as quickly blended into your concoction. Ferchoff brought in another son, Jeff Ferchoff, who has a degree in marketing, to help with the business. He built up the menu with wraps, salads and pasta dishes. She slimmed it down with low-fat, low-carb and zero-sugar choices – including the first sugar-free frozen custard on the market. 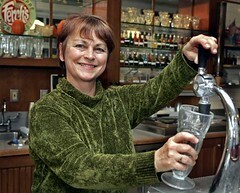 Still, she holds to her course on keeping Ferch’s a reflection of a time of innocence. But it isn’t simply about reliving the past. 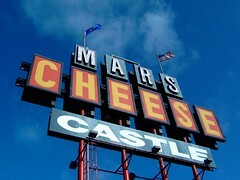 Mars Cheese CastleOriginally uploaded by ChicagoSage. Posted in Cheese and Dairy | Comments Off on June is Dairy Month! You are currently browsing the archives for the Cheese and Dairy category.